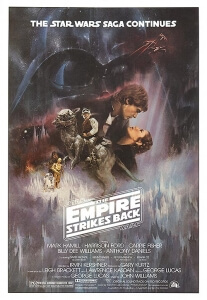 It’s impossible to talk about The Empire Strikes Back without first talking about that twist ending. Perhaps the most famous carpet-pull in movie history, parodied in countless media from The Simpsons to Toy Story 2, the moment where Luke Skywalker (Mark Hamill) learns about his parentage is the very definition of a game-changer; suddenly the stakes and risks become even higher once it becomes more personal to the main hero than previously thought. It shocked audiences back then, and it shocks new viewers even to this day – if you don’t believe us, click here for a new generation of fans watching this twist for the first time – and, if you really think about it, is solely responsible for the prequels in the first place. The twist itself is great fun to watch, even if you’re overly familiar with it, because it’s just the climax of a great sequel that manages to surprise and engage even more so than the first film ever could. Replacing Lucas as director is the late Irvin Kershner, and on writing duties this time round is Lawrence Kasdan (working with a script originally written by Leigh Brackett before her death two years prior to its release) – both of whom would dive further into the original characters and explore newer and exciting planets and environments than even Lucas himself probably would have imagined. Kershner, for instance, brings out better performances from his cast that feel more natural and relaxed than with the stilted nature of the previous film, and stages action set pieces such as the assault on Hoth and the final lightsabre duel between Skywalker and Darth Vader (played physically by David Prowse, vocally by James Earl Jones) with more tension and brutality (a lot of arms get chopped off in this series, we’ve noticed; it’s slightly more blood-hungry than we realised, and in a certificate U film as well!). Everything feels much more believable this time round, and because the stakes are higher and the losses greater we get more of a sense of danger around these characters who we’ve come to love in our own weird ways. The MVP of the film, outside of maybe Harrison Ford in his most memorable turn as Han Solo to date, is Kasdan – there’s a reason people rejoiced when he was announced to be sharing a writing credit for The Force Awakens alongside J.J. Abrams and Michael Arndt, because he brought to life these very basic characters that Lucas originally created and expanded them to be more than just simple cookie-cutters. Solo, for example, is still the rogue we know from last time, but a romantic sub-plot between him and Carrie Fisher’s Princess Leia humanises him and shows he has a slightly softer side without ever compromising his dapper ways (their final exchange in the film is testament to that). It also helps that Ford and Fisher have far better romantic chemistry than Hayden Christensen and Natalie Portman would later have, not least because they had much superior dialogue to work with (thank goodness there weren’t any scenes of Solo complaining how much he hates sand). Then you have Luke, who started off as a mere farm boy holstered into action and is now a much stronger character willing to learn more about the Force and how best to use it. Upon the ghostly guidance of Alec Guinness as a returning Obi-Wan Kenobi, he travels to the Dagobah system to seek the Jedi master, and unofficial mascot for the entire series, Yoda (voiced by Frank Oz, which would explain why he partially sounds like a senile Fozzie Bear). It’s through these sequences that we see Luke diving more into his own curiosity and learning how to evolve not just as a Jedi warrior but also as a more spiritual person. The scene in the cave, where Luke faces off against a supernatural version of Vader, may still baffle viewers as to what its true meaning is, but either way it serves to put him more on his path to righteousness and tranquillity, and it’s refreshing to see a main character who started off as a simple hero type and learn more about who he is and what he is capable of. It all leads up to the final battle where, as we’ve mentioned, the twist of all twists takes place. It is considered by many to be one of the greatest sequels of all time, not just for the revelation nearer the end but also for how it expands on what had come before and continues the story instead of just giving us the same thing we got before, only bigger and darker. It has an overall better grasp on character, on story, and on action than Lucas could ever try with the previous film, and we have both Kershner and especially Kasdan to thank for taking things to a whole new level which many thought would probably be impossible. Like most Star Wars fans, we would definitely rank it as our absolute favourite of the series thus far, for all the reasons we described and more, but mainly because it took something that was fairly bare-bones and gave it more meat than anyone would have predicted.